Why is Pro-Gest so trusted? Maybe because it's been the leader since 1978. For over 35 years, women have relied on Pro-Gest for support at midlife. Why is Pro-Gest Cream so trusted? Maybe because it's been the leader since 1978. For 35 years, women have relied on Pro-Gest for support at midlife. Our Pro-Gest 4 oz. value-size tube contains about a two-month supply. 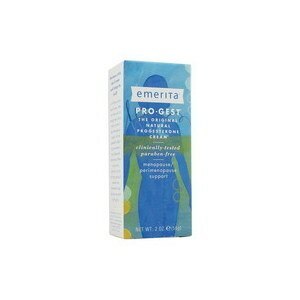 Pro-Gest Cream contains 450mg of USP Progesterone per ounce (20mg per 1/4 teaspoon). The original natural balancing cream. Ingredients: Water (Purified), Tocopheryl Acetate (Vit E), Aloe Barbadensis (Aloe Vera) Leaf Juice, Carthamus Tinctorius (Hybrid Safflower) Seed Oil, Panthenol, Glycerin, Prunus Amygdalus Dulcis (Sweet Almond) Oil, Glyceryl Stearate, Cetyl Alcohol, Sodium Behenoyl Lactylate, Stearic Acid, USP Progesterone, Phenoxyethanol, Caprylyl Glycol, Sorbic Acid, Carbomer, Potassium Hydroxide.